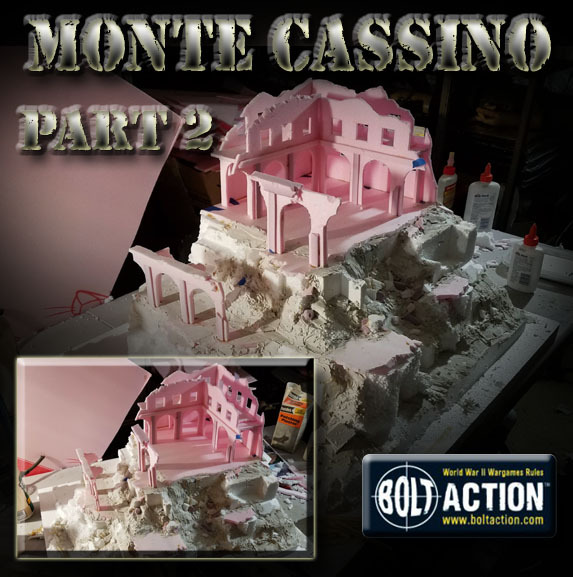 Part 2 of the Monte Cassino display board continues with the setup for adding plaster to all the foam work. 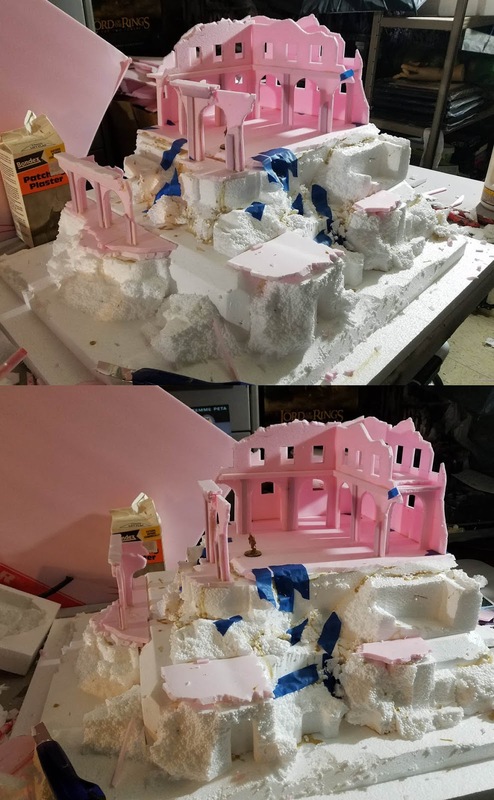 As I mentioned in the first post, the interior of this upper level would have to be removed for painting before I could finish that off by adding rubble, etc. 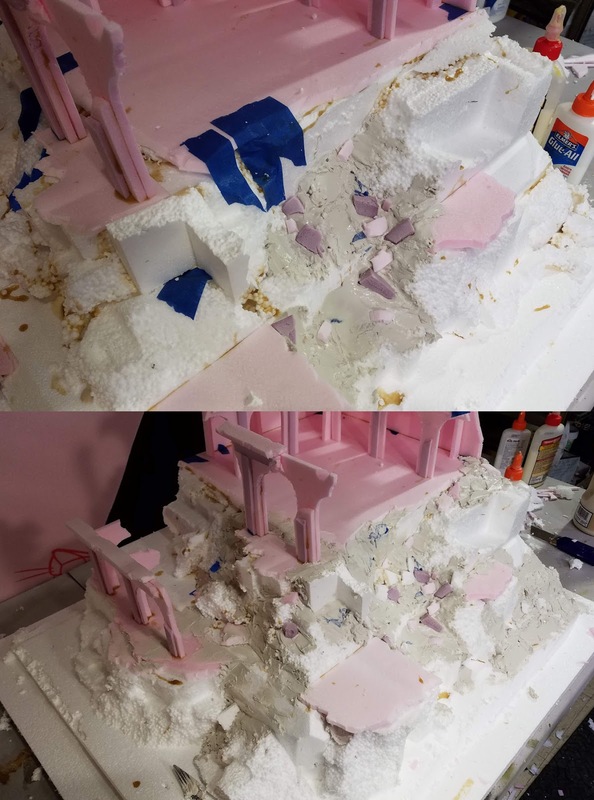 Using those junk pieces of white foam gave me several advantages, one of which was the basic shapes that appeared as I broke them apart. You can see what looks like the walls of foundations and lower sections of the board. When I gathered references, I noticed that the intense bombing even tore away parts of the hilltop, taking the structure along with it. So, I thought these exposed sections might be interesting! I used the painters tape to hold the white foam sections in place as the glue set. 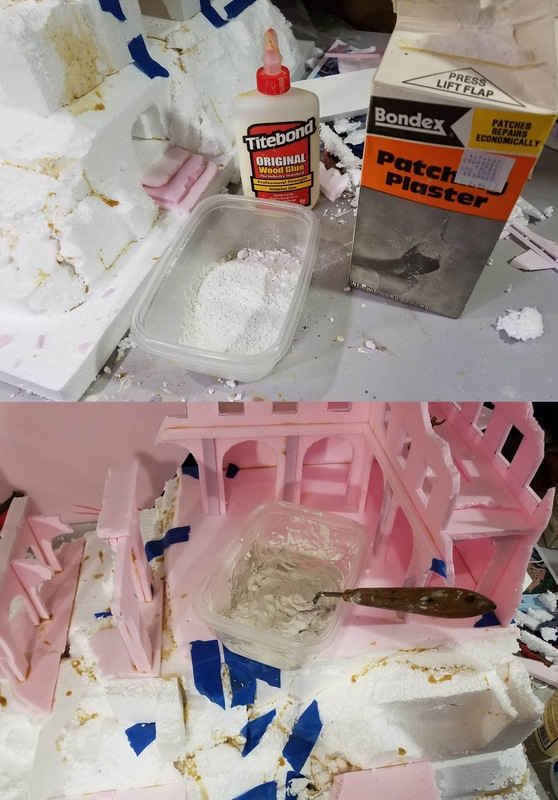 When I was working on the forest terrain pieces, I noticed that adding wood glue to the plaster mix provided extra strength and adhesion. That was going to be very important on these near vertical sections of ground and broken walls. Since you have to add moisture anyway, it might as well add that flexibility and holding power! 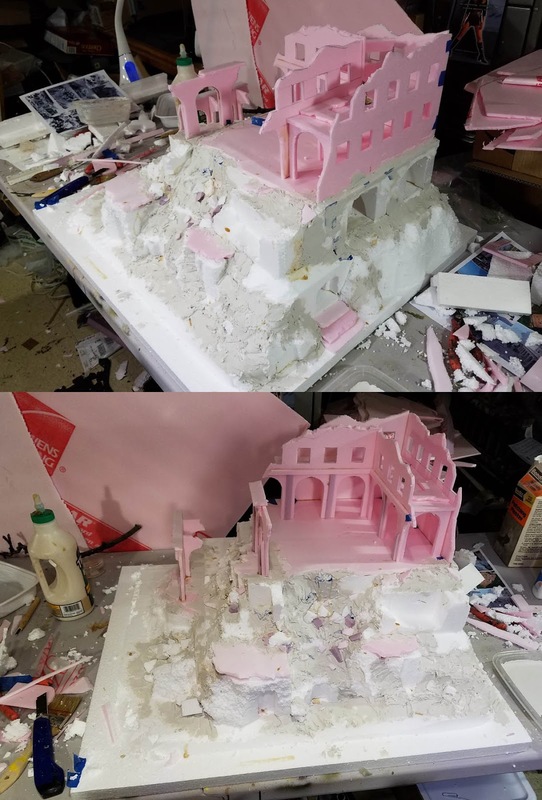 As the plaster was setting, I took broken bits of foam and created some larger sections of shattered walls. 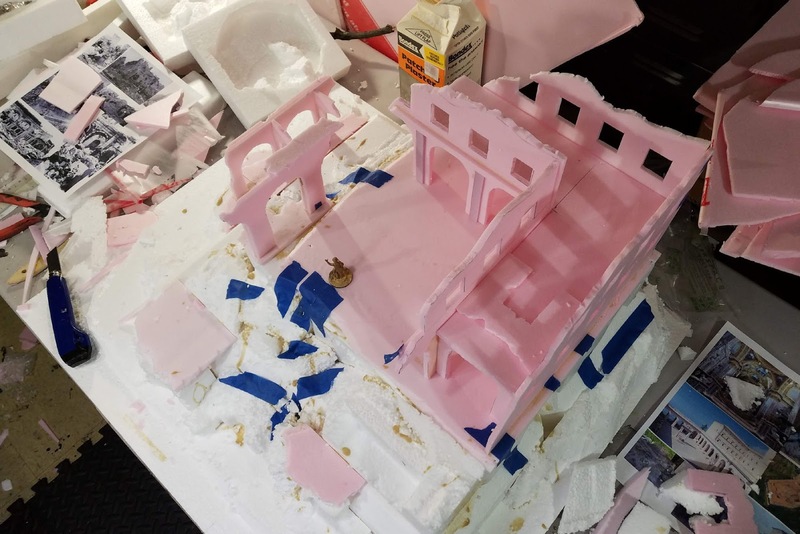 The plaster will also cover up the very obvious "bubbles" of the white foam chunks. 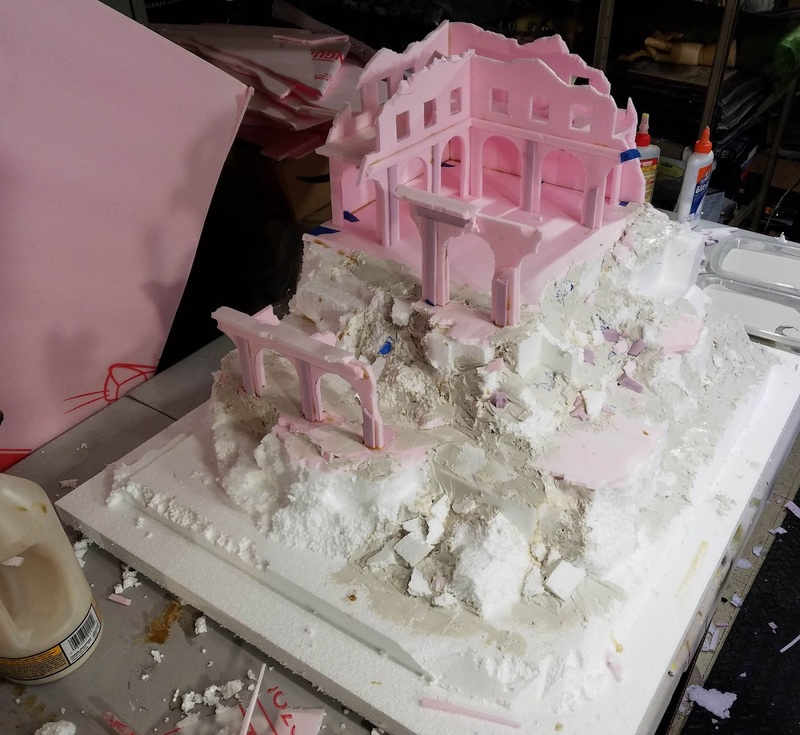 Here's a closer view of the scrap chunks of foam added to create a landslide effect. Again, looking at the references the entire structure resembled a collapsing sand castle. Now for the really fun part! 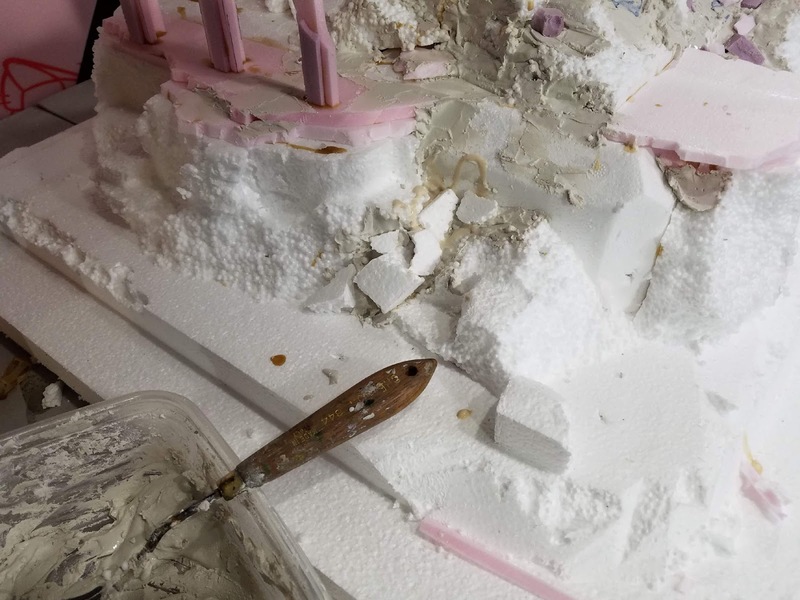 I took some plaster mixed with a little more water so that it would flow into some quick moulds. This would be a larger experiment of something that I discovered by accident on a previous project. 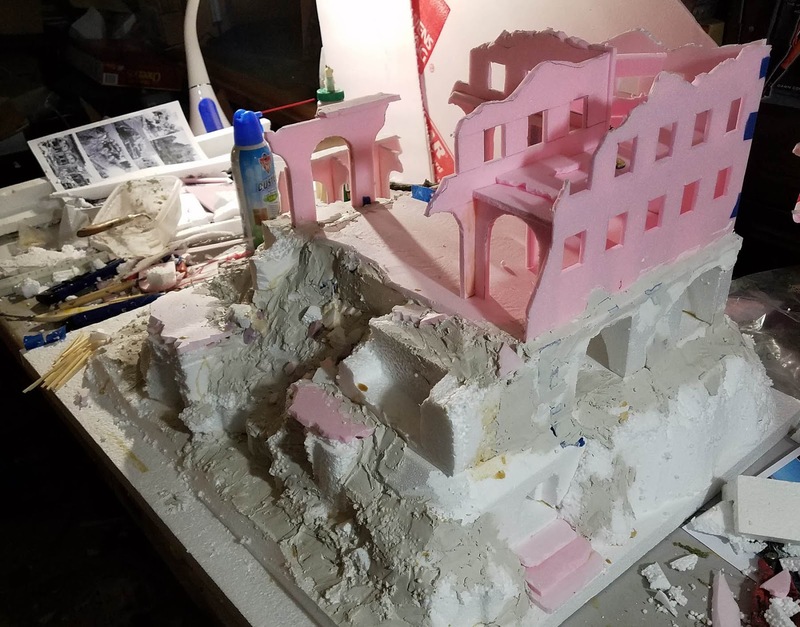 In that instance, I had taken left over plaster chunks from my mixing container and poured those out onto wet glue and plaster on a hillside to create some rocks. Let's see if I can make some broken floor and wall pieces from this! Adding even more wood glue to a plaster mix, I would set those plaster chunks down onto the surface, pressing on them a bit. This pressure caused additional breaks and cracks, and gave them a very natural look. 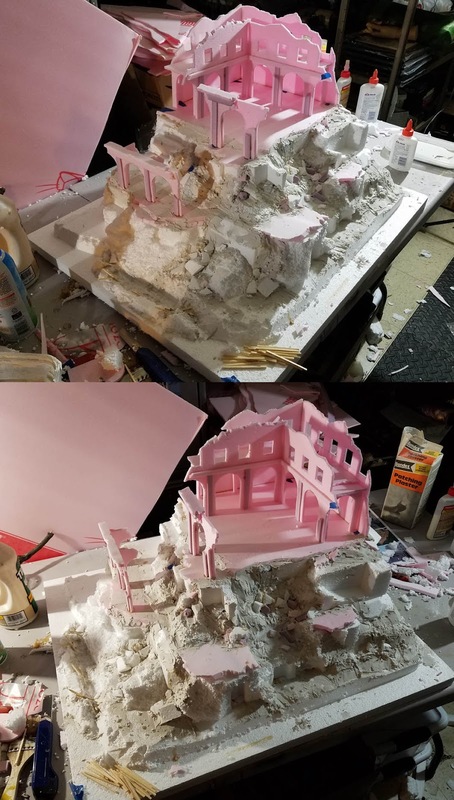 In the past, I have carved up broken sculpey pieces to create broken walls. That is OK on small bases, but not on the massive scale of this project. The cracks and breaks were even more pronounced when they were placed on very uneven surfaces. 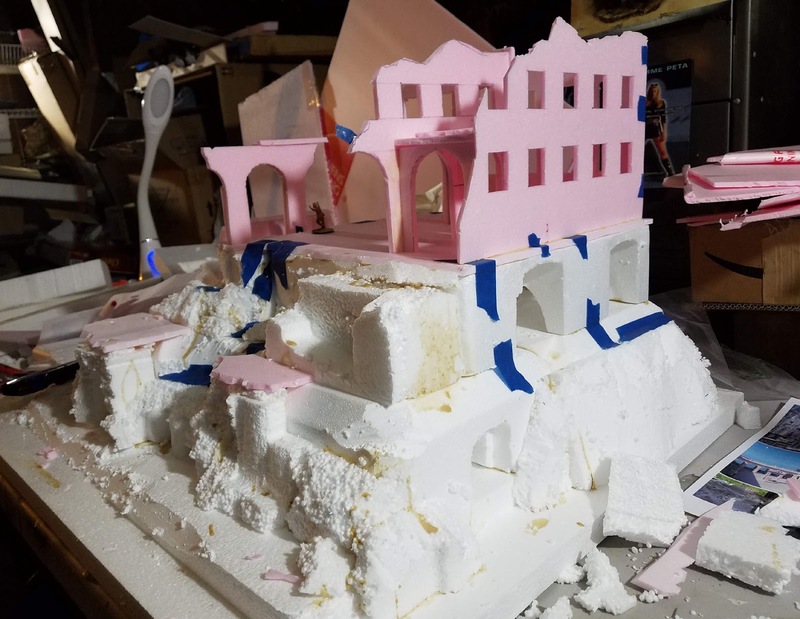 More plaster was added to the lower levels also, keeping in mind that sand castle effect. 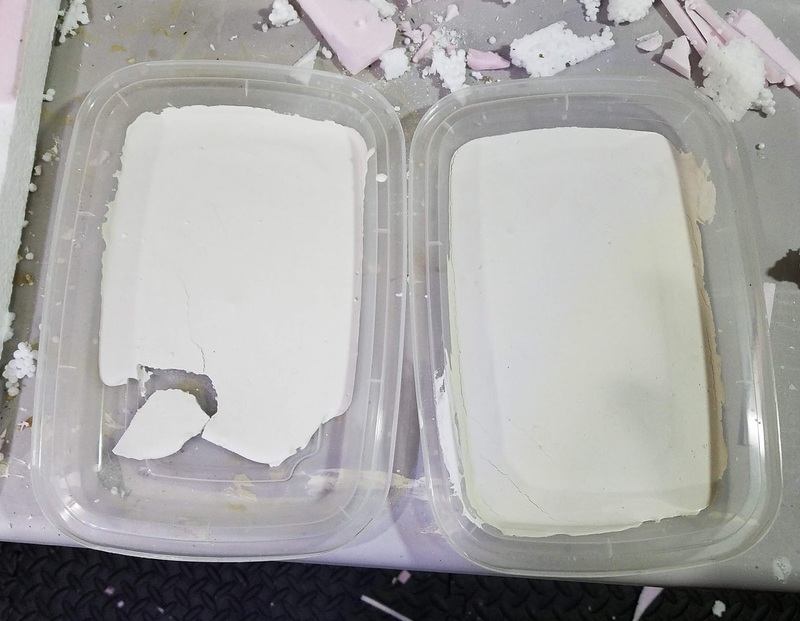 I tried to keep the plaster as thin as possible, because that could add a bunch of weight. The use of the white foam certainly cut down on the extra pounds! Let's not forget the purpose of this project... and that is the primary use as a display board. I will be doing additional posts on those individual units and weapon teams. 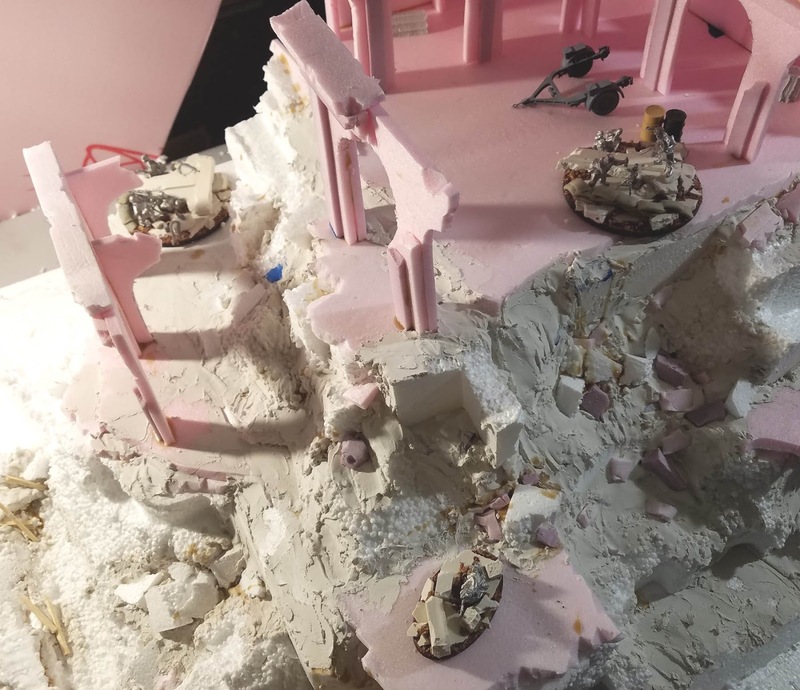 The bases were made to match the terrain as closely as possible. I tried to leave specific areas on the board for each figure, so that it also became a diorama. When it is used for games as a terrain piece, these key places will be important for units as cover, line of sight, etc. Stay tuned for part three!! Many thanks! It was very fun to create! super intéressant ! A suivre!